the many benefits of CyberStore for SYSPRO. dynamic content, and organization without boundaries. When people decide it's time for e-Commerce, more often than not, they begin finding B2C (business to consumer) solutions. Undoubtedly a large segment of the e-Commerce world. When you are selling to other businesses, your needs are different. However, running two solutions to accommodate both is not the answer. CyberStore for SYSPRO combines B2C & B2B in a single unified solution. Choosing SYSPRO ERP makes a strong statement about how you connect to your business. 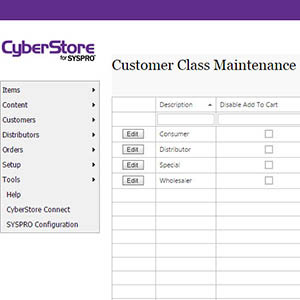 We build on that commitment by giving you real-time e-Commerce connectivity with CyberStore for SYSPRO. Say goodbye to batch data synching and maintaining two inventory levels forever. e-Commerce solution needs to match. 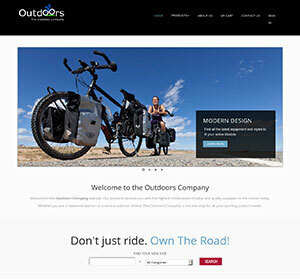 While CyberStore offers various themes you can use right away, you are not locked into them. Your CyberStore can be totally customized to match your identity and we can do it for you!